I love awards season! The Golden Globes hooked me on Sunday and reeled me into the bedroom so I could watch and not bother the other family members. I love the gowns, the tuxes, the speeches — all of it. I have a passion for awards. I now want to see all the movies and TV shows, and hear all the music that won those awards. It’s only natural, I think, to want to continue participating in the “buzz” that surrounds awards. This is the same feeling I have when I read books that are considered for awards. I read list after list, recommendation after recommendation, to find the books that I consider noteworthy. I share books with my classes. I read books aloud, I talk about books, I show my students how books affect my life. That “buzz” is the passion that led me to take some time in class to teach a Mock Caldecott unit this year. Wow! What an experience! My students are actively engaged, in learning! Yes, we are meeting the standards. I can prove it: 6.RL.2.1 (Cite textual evidence to support analysis of what a text says explicitly as well as inferences drawn from the text); 6.RN.2.3 (Analyze in detail how a key individual, event, or idea is introduced, illustrated, and elaborated in a text); 6.RL.2.2 (Determine how a theme or central idea is conveyed through particular details…) Wow! Our experiences matter! We will decide a winner on Thursday. Then we will watch on January 23rd as we find out if the real voters for the Caldecott Medal and Honors books will issue the same awards that we did. It’s going to be great! Just like learning should be. 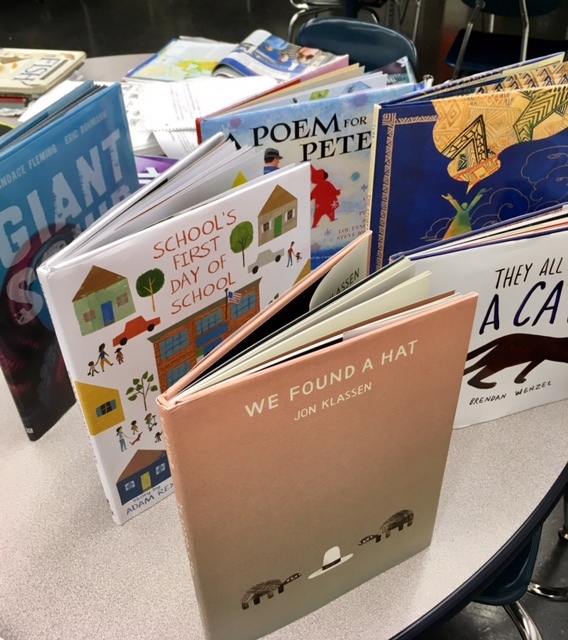 Jennifer, I love that you did a Mock Caldecott unit with your students. I’ve read all of your titles except Giant Squid. Time to request if from the library. Your students will never forget their experience with these books. Your passion will be a wonderful memory for them. Awesome ! I did this last year but as basketball brackets ! It was pretty awesome ! Basketball brackets but for books is what I meant to say ! This is my first year trying mock Caldecott and I’m learning a ton! I had never really looked at the criteria before. It is rigorous (dare I use that word?) thinking. So glad you are on this road as well!